The Wardrobe in Leeds is hosting a Fusebox mini-festival tonight and tickets are going fast so be quick if you want to attend! Fusebox and Efpi are delighted to present a one night mini festival featuring Manchester’s Beats & Pieces Big Band and a collaboration between Metamorphic (led by Leeds pianist/composer Laura Cole) and Norwegian vocal trio Røyst. With the release earlier this year of their second album All In, Beats & Pieces have firmly established themselves as one of the leading ensembles of its kind in Europe. 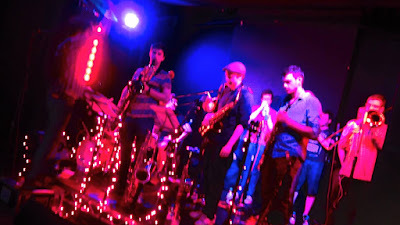 Led by Ben Cottrell and bringing together 14 incredibly creative musicians, their energetic performances are influenced as much by Michael Jackson, Björk or Radiohead as by Duke Ellington, Gil Evans or Loose Tubes. Metamorphic and Røyst Trio will debut brand new material developed especially for this collaborative tour, fusing elements from contemporary jazz, folk and world music in song-based compositions that challenge the traditional role of the singing voice. Both Metamorphic and Røyst will also present music from their own critically acclaimed albums alongside the joint material. Tickets cost £12 on the door.